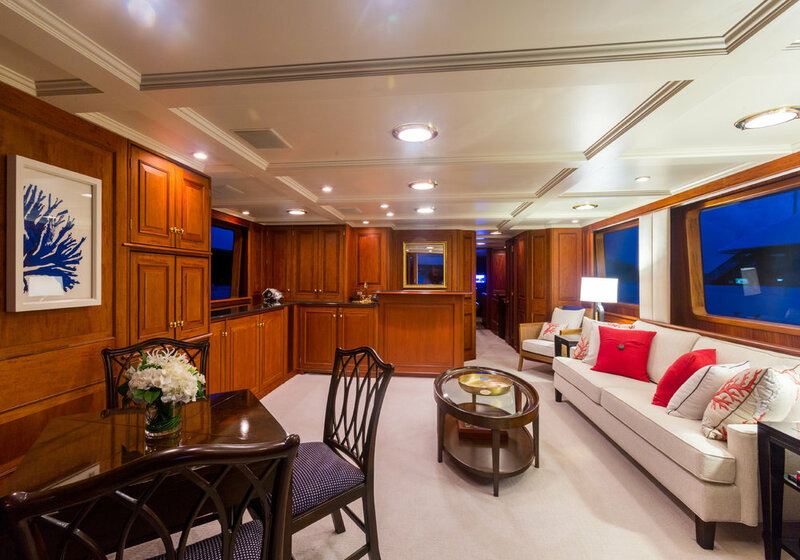 Yacht Lady J offers a spacious, luxurious and welcoming interior. 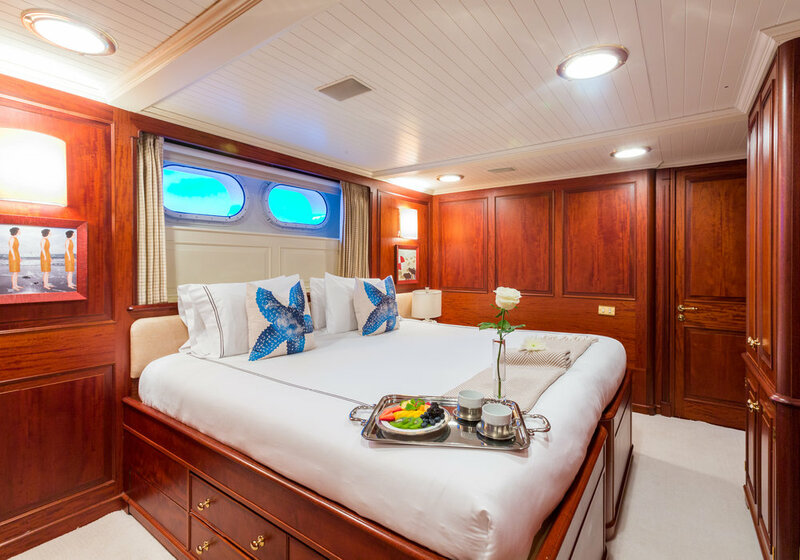 WITH A CONVENIENT AND FLEXIBLE LAYOUT, THE LADY J ACCOMMODATES UP TO TWELVE GUESTS IN FIVE OUTSTANDING STATEROOMS. 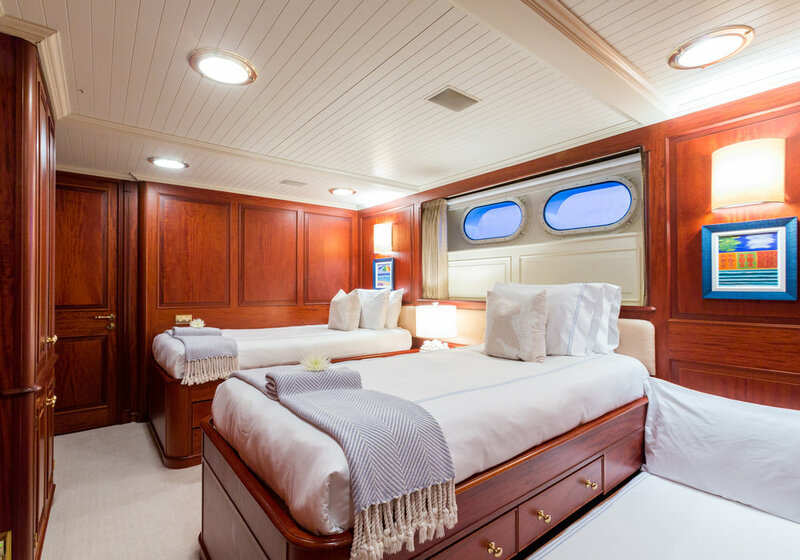 The Lady J is configured with a king master, two queens, and two twin staterooms (convertible to kings) each with a trundle. 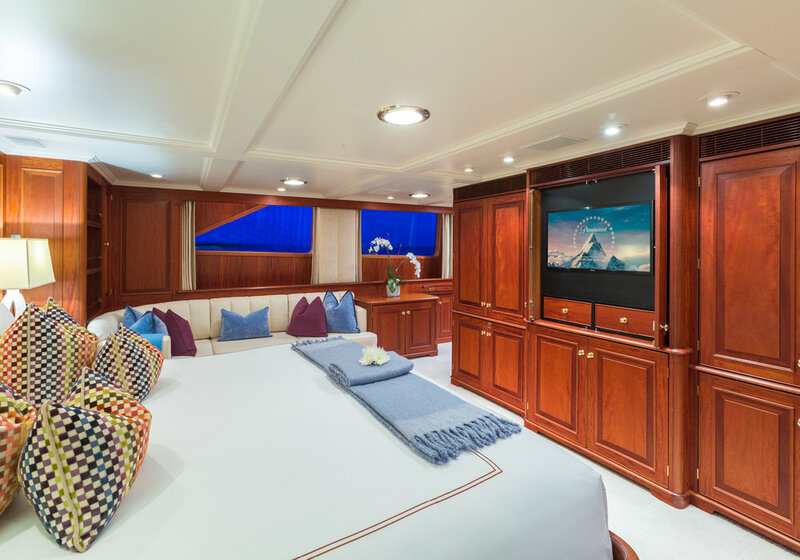 Each cabin is unique but each is equally luxurious and appointed with sumptuous soft goods and linens. 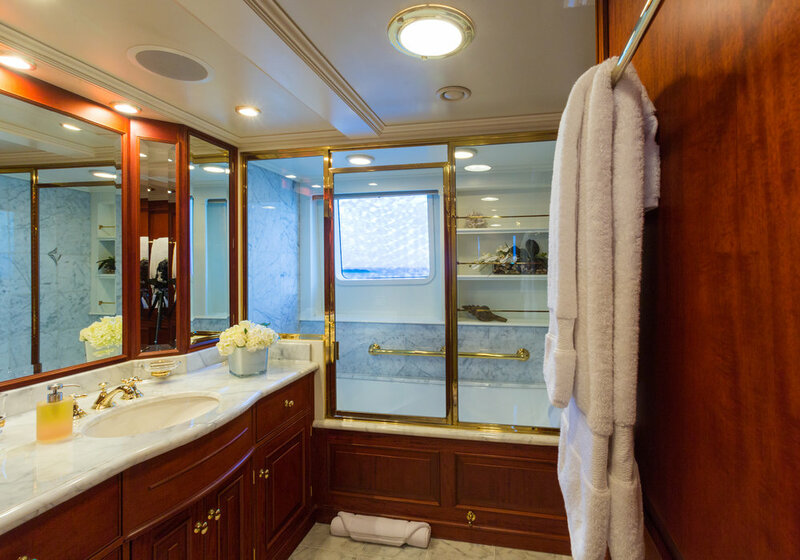 Every guest stateroom has ensuite facilities that include a shower and tub, generous storage, and a full entertainment system including flat screen TV / DVD / CD, iPod connections, and WiFi. 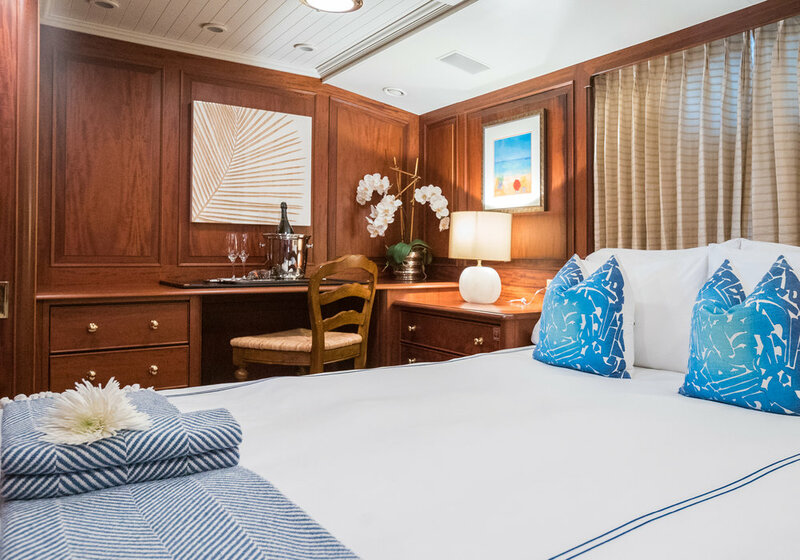 The ambiance of the staterooms is that of sophistication and luxury with rich wood finishes and tasteful details. 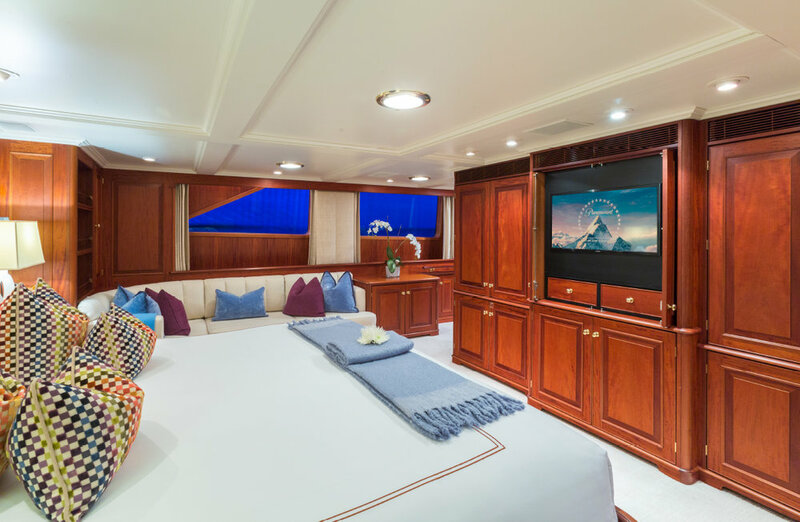 Spacious and exceptionally private, the full-beam king master suite is located on the main deck. 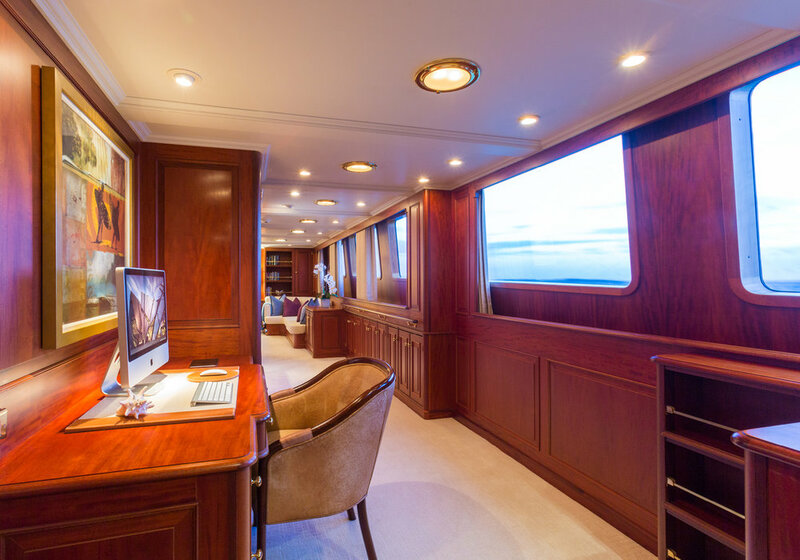 An office, sofa, built-in bookcases, and additional desk are just some of the features of this magnificent stateroom. 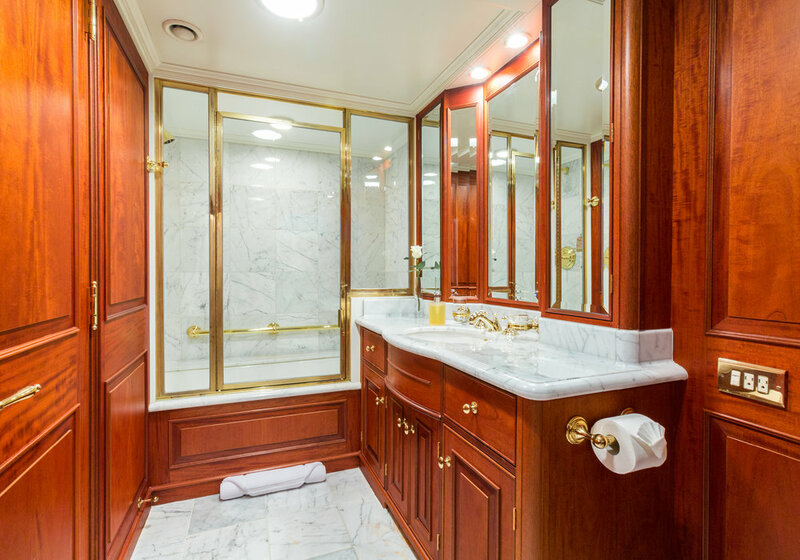 The his and hers bathroom has a separate shower, private head, and two sinks plus large Jacuzzi tub. 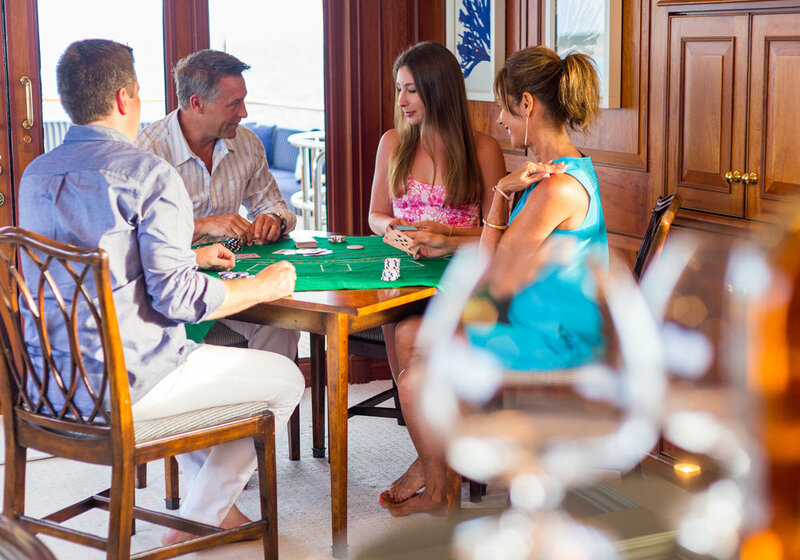 LADY J OFFERS MANY OPTIONS FOR DINING, FROM ALFRESCO MEALS TO CASUAL COCKTAILS OR LUXURY MULTI COURSE DINNERS, THERE ARE PERFECT SPACES FOR ENTERTAINMENT THROUGHOUT THE YACHT. 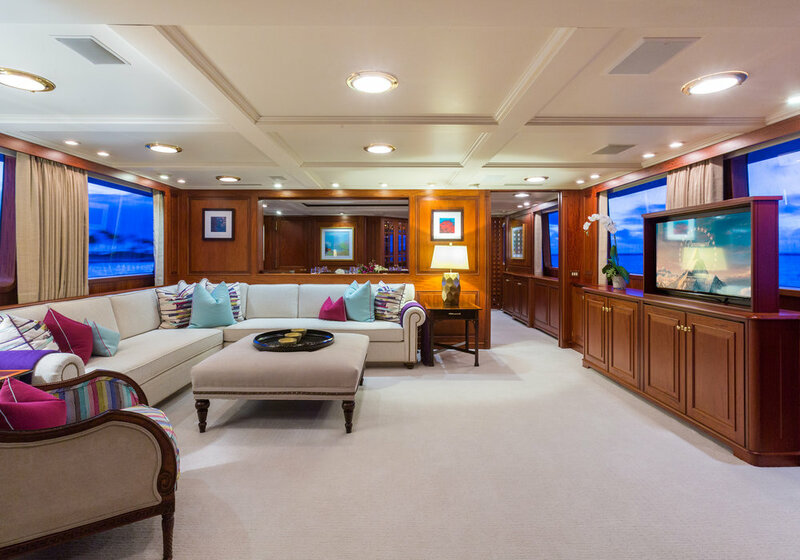 The Lady J has been refurbished with new, exquisite furnishings. The Main Salon is spacious and comfortable and provides a wonderful area for unwinding while watching your favorite movie or reading a good book. The salon is equipped with a 50” retractable plasma TV, DVD player, and top-of-the-line sound system. 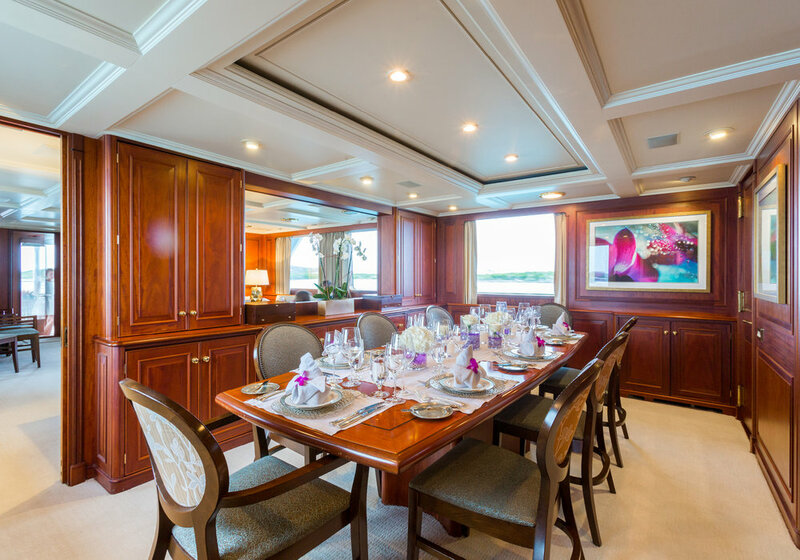 FOR FORMAL DINING, the Dining Salon seats up to 10 guests comfortably and features a beautiful, built-in wine cabinet. UP ONE LEVEL, the sky lounge has yet another seating area, game table, bar, and media center with 50” TV and DVD player. 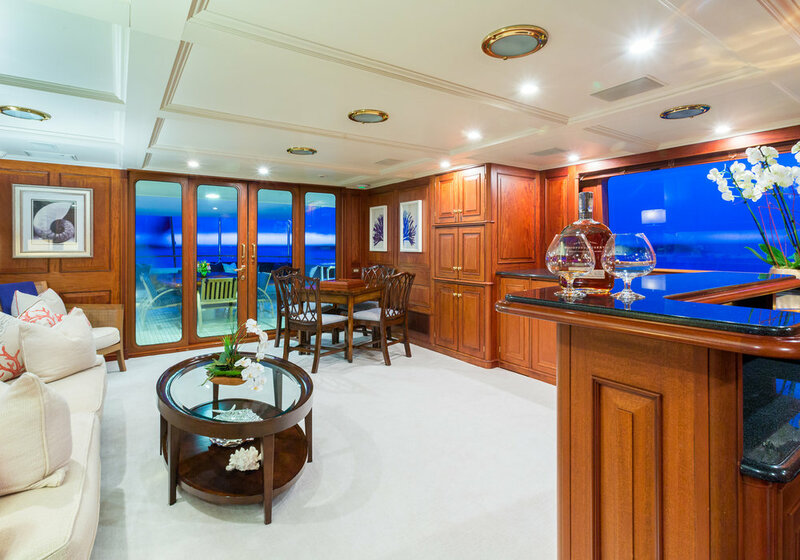 This is a perfect spot for entertaining or as an additional recreation area for kids, while parents relax in the Main Salon.